'Baarish' (rain) and 'Chowmein' (noodles) make for a lethal combo, but not when they are in direct contact with each other. There needs to be a tarpaulin, a shed, or some kind of roof (even an auto-rickshaw as in this case), separating the two. Their latent heat is polar opposite, which is why they can only co-exist in their given spaces. However, their parallel existence only makes the world a better place. Similarly, in Tigmanshu Dhulia's new film on ZEE5, Taapsee Pannu and Amit Sadh play chowmein and baarish. They are like chalk and cheese (if we are allowed another analogy here) in terms of their personalities but also their backgrounds. Sadh plays Siraj, (or Suresh for his landlord, as Muslim tenants are a no-no in Hindu-dominated localities), who works in the Chhatrapati Shivaji Maharaj Vastu Sangrahalaya, the Mumbai museum. 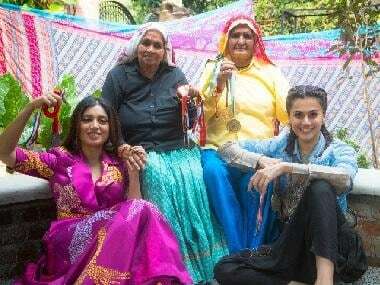 Taapsee plays Neelu, the daughter of his landlord, and a background dancer in Bollywood. While Siraj has moved to Mumbai from Lucknow to chase his dreams, Taapsee aspires to move out of the city she finds asphyxiating. Siraj, who has fallen for Neelu, offers her to pay money in exchange of reciprocation. As weird as this arrangement sounds, Neelu agrees to be a part of it. She, however, puts forward some 'terms and conditions' that the relationship will remain professional and not turn physical at any cost. Life goes till Siraj starts taking Neelu's professional commitment for granted and proposes marriage to her (yes, while eating chowmein in an auto-rickshaw when it is raining). She gets taken aback by him not only breaching the contract but also asserting his Muslim identity on their would-be children. She mocks him for not being audacious enough to reveal his identity, which prompts him to confess both his love and religion to her father. The landlord agrees to get her married to him, only because he will not have to pay any dowry to his tenant in. Relieved by the outcome of this man-to-man conversation, both of them do not pay any heed to Neelu's desires and consent. Baarish Aur Chowmein is not only a comment on the religious discrimination, but also the gender disparity prevalent in society. It hammers home, in all its subtlety, that Hindus and Muslims must peacefully co-exist, or form unions like marriage, to make the world a better place. But such a union, irrespective of the religions of the bride and groom, should not be formed without the consent of the woman. 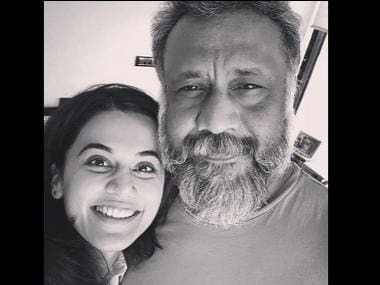 Only in terms of the issues it raises, the film feels like an amalgamation of Taapsee's two most critically acclaimed films yet: Aniruddha Roy Choudhary's 2016 film Pink and Anubhav Sinha's recently released Mulk. But unlike both the courtroom dramas, Taapsee here does not stand in front of the jury, as either a victim or a lawyer. She comes across as a decisive woman who is extremely liberated in a two-by-two matchbox, even though she periodically reiterates that the limited space curtails her freedom. She makes a distinct mark from her performance in Mulk, still fresh in the audience's minds, through a precise Maharashtrian accent. She delivers a "Main resign maarti hai," with a refreshing sense of abandon. Amit, though sincere and relatable, does not surprise the audience as much as his co-star does. However, he does prove that he is a bankable lead actor and has the chops to shoulder a film, given the full support of talented co-stars and an able director. Tigmanshu's decision to helm a sweet, simple romance is a refreshing departure from the edgy dramas and patriotic films he has been dishing out lately. Baarish Aur Chowmein does comment on the threats to India's secular fabric but it does so through a micro angle, instead of a period patriotic drama like last year's Raag Desh. He says that the film is a homage to Hrishikesh Mukjerjee and that he has tried to give it a Mani Ratnam treatment. Well aware of his inexperience in the genre, he rightly admits that his offering ranks way below, when compared to the ones by both the filmmakers. However, to his credit, he does take a detour from the dingy Saheb, Biwi Aur Gangster franchise and successfully paints a romance in all its simplicity. A gaping hole in the direction, however, is the jarring background score. It hammers on the audience's eardrums, taking the aesthetic out of the window. The simplicity gets diluted because of the sound designer' counterproductive efforts, as they discount the audience's intelligence and overestimate their hearing capacity. Kausar Munir's writing has an inherent poetry and does not need the crutch of an irritable background score. The cinematography that captures Mumbai during rains and the production design of a packed Mumbai locality counter all the noise that ends up derailing the narrative. Baarish Aur Chowmein is a part of ZEE5's initiative to release 12 films over the course of 12 weeks, helmed by six directors from India and Pakistan each. Munir, however, does reiterate through her dialogues that the film does not project India as the 'Baarish' and Pakistan as the 'Chowmein', or vice-versa. The two countries are not even a part of the debate here. The film comments on the plight of Indian minorities, whether it is a Muslim man looking for an accommodation in a Hindu locality or a woman seeking to prove that she is capable of carving out an identity of her own.